Hong Kong for Families: Visit the Science Museum including the Children’s Gallery! 1 Hong Kong for Families: Science Museum including the Children’s Gallery! 2.0.2 2nd Floor: Grab yourself a spot to watch the WORLD’S BIGGEST ENERGY MACHINE in action. Hong Kong for Families: Science Museum including the Children’s Gallery! On our very first day in Hong Kong, the morning of our arrival, we had big plans but I’d underestimated the power of ‘jet lag’ – it gave me serious BRAIN FUZZ. Took quite a few hours, and numerous cups of tea, and food, before I felt even half normal. Plans changed. We needed to take it slow! Thankfully, my darling friend Tania, a close high school buddy, was our chaperone and guide this day, and somehow managed to lead us to our destination, the Hong Kong Science Museum. It wasn’t easy to find for us, but perhaps it’s because we came via way of ferry, with a sidetrack to a playground? You’d think it would be, given it is on every tourist map, and in all the guide books, and is even sign-posted by these pink signs. But even with a local expat in tow, we did go round and round in circles for some time. I’m not sure I ever would have found it with my brain the way it was that day! But we were so glad we did. The Science Museum is definitely on our “Hong Kong for families” list. There’s over 500 exhibitions over four floors, and more than 3/4 of these are hands-on, AND super-dooper kid friendly. My boys LOVED the Children’s Gallery. It’s on the top floor, the 3rd level, but we’d suggest heading right up to the top first and working your way down. THIS is where the kids, 3 -8 years old, will want to spend most of their time. Ned and Jack were mesmerised by the Magic Ball, a ping pong ball that they could send on a round-about journey forced by wind flow! They rolled cone-shaped wheels down the train track, and explored how and why trains don’t derail. They discovered a gigantic lava lamp and watched the liquid bubbles as they raced towards the top, but once Ned found the bubble hoops, that was it. Making king-sized bubbles with new-found friends – well, no wonder he didn’t want to leave. As fun as this was to watch, it was also a great laugh to try. Bubble making is slippery, and there might have been one or two slip ups? Or should that be ‘slip downs’? Entertaining for all who were watching, no doubt. Keep an eye on those toddlers – if you have trouble maintaining your balance on slippery surfaces, imagine how they go! Whoopsie Daisy, there goes another one. There is a padded play area with stacking blocks and tunnels in the Children’s Gallery too, but this is just for the wee ones. Ned tried to enter and was given a stern warning. This bit is shoe-free too, so be sure to take note. Once you find a way out of the Children’s Gallery (Warning: it might take some time), you can explore the rest of the museum. While this exhibition is all about saving energy, I’m not sure my kids understood that. But they were excited to ‘drive’ a car, and press a few buttons on the different displays. 2nd Floor: Grab yourself a spot to watch the WORLD’S BIGGEST ENERGY MACHINE in action. Find a spot somewhere in the middle, near the escalators, and watch this feat of engineering roll out. “Shows”, for want of a better word, start at 11:00 am, 1:00 pm, 3:00 pm and 5:00 pm. The kids will be held spellbound by all the balls moving, jangling, dinging, rattling, pinging, and rolling. The balls hit the drums, sound the chimes, strike the Gong, play the xylophone and ring the bells – a musical symphony for your ears AND eyes. With thanks to the HK Science Museum buffs. This exhibit demonstrates energy conversion through the movement of balls down the towers. 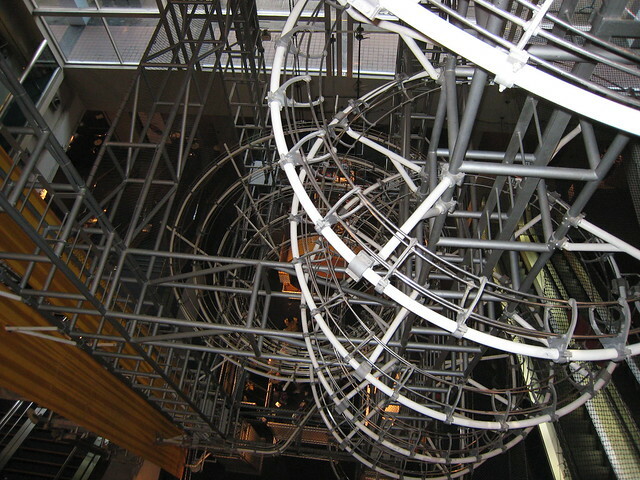 When set in motion, a continuous stream of balls will roll along tracks within and between the two towers like a roller coaster, producing dramatic sounds and visual effects. Each synthetic fibre ball has a diameter of 19 cm and weighs 2.3 kg. The total length of tracks is more than 1.6 kilometres. It takes about 1.5 minutes for a ball to travel from Tower A along the longest route before returning to the starting point. The 2nd floor also has a number of zoned areas: Food Science (the kids will want to ride the bike that shows how fuel is burned), Home Technology, a Telecommunications Gallery (the kids will want to call you on the ‘switchboard’ and ‘be on TV’, and a Prototype Zone, filled with hands-on games and activities. As well as all of this, there’s a whopping big aeroplane suspended from the ceiling! Ned found this section fascinating – bright, and colourful, and interactive. There was an electricity plug to pull, electricity conducting experiments and magnetic motors to spin. But the rest of this level, skip it. OH and S (Occupational Health and Safety) can never be made exciting. This floor was our second favourite spot after the Children’s Gallery. There’s DINOSAURS, and BRAINS. What’s a boy not to love? Roam the Gnome and I (with a sleeping Jack in tow) had a giggle in the World of Mirrors. What is it about magic morphing mirrors that makes me laugh myself silly at these reflections? Oh, it’s oh-so funny to be as short as an elf, as tall as a long-necked giraffe, and as plump as Mrs WashaLot, with a BIG BUM to boot. We also visited a Special Exhibition on this floor. The one we perused, Strange Matter, was scheduled to finish in April 2015 but I’ve no idea what’s taken it’s place. Call and ask perhaps? There’s a Museum Shop located in the main lobby with lots of interesting gifts, souvenirs, books and publications. Here’s a link to show you some of the souvenirs on offer! Food and drink is not allowed in the Science Museum except in the Sitting Out Area. We’d suggest grabbing morning tea or lunch before you enter. You’ll want to be here a few hours and don’t want to be stuck with hungry kids. Our best budget friendly tip? Entrance is FREE on Wednesdays. Entry is only $25 HK for an adult ($4.50 AUD approx), $12.50 HK for kids ($2.30 AUD), and children under 4 years old are FREE. It’s a bargain. We’re not going to squabble or even try to find a discount at that price. If you’ve nothing much else to do, a visit to the Hong Kong Science Museum will be moderately fun for the kids. I’d suggest combining this place with a visit to the “Charlie Brown” cafe (aka Snoopy Cafe) that is not too far away. We’ve been to lots and lots of museums, science museums, and dedicated “children’s museums” around the world – this one doesn’t rate compared to lots of others. But standing alone, it’s still a fun spot for a few hours of hands-on activities for the kids and families in Hong Kong. – Around 18-minute walk along Cameron Road from B2 Exit of Tsim Sha Tsui Station towards the direction of Tsim Sha Tsui East. – Around 20-minute walk along Austin Road from D Exit of Jordan Station towards the direction of Tsim Sha Tsui East. – Around 15-minute walk along the footbridge from Hung Hom MTR Station towards the direction of Tsim Sha Tsui East. Thinking about a trip to Hong Kong with the kids? Here’s a link to find ALL the information you need to know, in one place.